The famous ride-hailing apps - Uber, Lyft, Gett- have been growing from strength-to-strength with its international foray in different verticals. The ride-hailing and ride-sharing battle between the top contenders wouldn’t have seen any alternatives catching the attention if they weren’t dogged by any scandal after establishing itself as the giant in the ride-hailing market. These backlashes against taxi companies have forced people to start looking after alternative taxi booking apps henceforth, giving other taxi startups a new avenue to invade successively. Not long ago, we’ve seen a plethora of mobile app development companies selling taxi clone apps on the names of taxi white-label solution, readymade taxi app solution, Uber-like taxi app etc. to cater their wide customer base. But the glitch arrives when these taxi startups/enterprises/fleet owners operating across territories faces certain shortcoming features that the former possessed. Results? All the relentless marketing efforts go in vain. The dashboard gives Admin a god view to see the total number of ongoing rides, total amount earned, view total active drivers, active customers and active bookings. Besides that, an Admin can also view an extensive report where he can check and update the vehicle type, commission rates, surcharges, cost per vehicle and more. User Wallet report: Admin can check the total amount in all users’ wallet. Driver Payment report: Admin can see total payment earned by the driver day/week/month/year wise. Ride Acceptance report: Admin can check the number of accepted rides by the drivers. Total Earnings report: Admin can see the total number of earnings from rides, advertisements, commissions etc. This functionality empowers Admin to track their drivers’ at every moment on GPS enabled Map in the real-time location which helps them to streamline the rides to attain maximum feasibility. For instance, if an Admin receives a ride request on phone call, dispatchers can assign the ride to the driver nearest to the location of the customer and schedule trips. It is incredibly important to maintain effective communication while managing numerous drivers and customers. The in-app messages and push notifications feature embedded in it allows admin to send messages to any or all drivers and customers at a time. There are situations where the driver doesn’t want to continue with the job, or driver misbehaves, or do not follow the company’s code of conduct, in such cases,Admin has full authority to deactivate any drivers’ account upon his job termination and contrarily activate the account upon new sign-ups. This feature gives the Admin a god view to see no. of ongoing rides on the LIVE Map, no. of rides requested by the customers, no. of rides accepted and canceled by the drivers. The major data breaches and cybercrimes which steal customers’ personal and banking details can only be avoided by integrating secured payment gateways like Braintree Stripe, CcAvenue, Authorize.net, GooglePay etc. A dispatcher panel allows admin to create rides upon the users’ request. There are times when a user does not have an app or fails to meet the internet connection. In such adversities, dispatchers can take the phone bookings and schedule the trips for the passenger by assigning it to the nearest driver from passengers’ location. This way there is near to zero chances to lose any of the passengers. The admin can see all the trips scheduled for the future and assign the driver automatically/manually for those rides. With the rapidly growing technology, automation becomes an indispensable part of any business today. Falling as prey to any confined taxi app development company is not at all a profitable exchange. 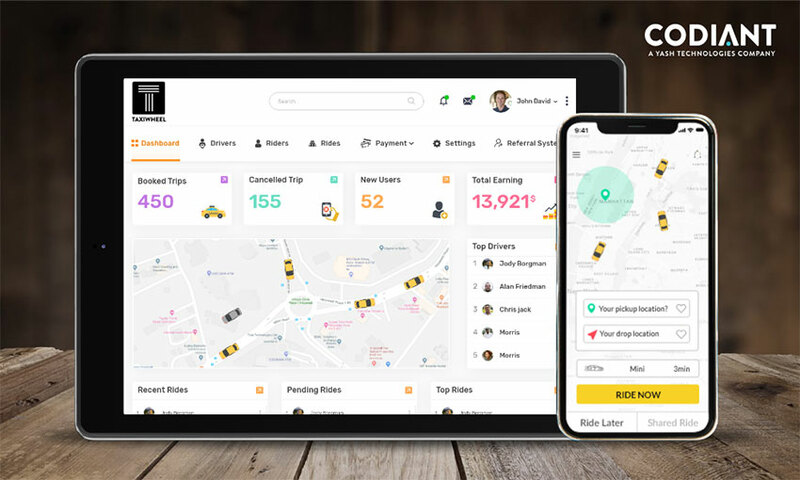 Codiant’s smart taxi app solutions acknowledge every void in the current taxi clone software readily available in the market and with a detailed analysis, the company develops and delivers taxi app solutions that are designed to drive revenue, automate bookings and improve operational performance. It’s the right time to accelerate your taxi business with an intelligent Admin and Dispatch solution and boost your company’s bottom line.